This entry was posted in Opiate, Success Story on October 23, 2013 by ATMC Team. I would suggest ATMC to any person with any sort of addiction, as I have gone to several different rehabs and now I know there is no place that is like ATMC. I started using Opiates at age 13, and started to shoot heroin by the time I was 14. I battled my heroin addiction for nearly four years. I neglected every person who meant something to me; I pawned anything and everything that I could for money and was homeless for some time. I felt trapped inside of a world that I didn’t think I could escape. Fortunately, my mother did not give up; she found a place around 3 months ago called ATMC (ATMC). My Mom and I went down to check it out and see if I would want to go. I felt a great vibe, and the residents were laughing and smiling. I gave in finally and became an inpatient. Then I was given Suboxone and was able to get off the Suboxone in one week with very mild opiate medication withdrawals, nothing compared to heroin withdrawal. After my first month I started to feel like I was alive again. I began to enjoy life again, which is something I did not think was possible without drugs. 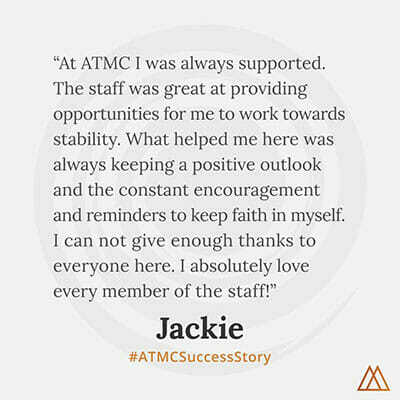 ATMC’s staff is awesome, they actually care and they understand. Between the staff and the residence it’s just a big family. The friendships I have established with good people who I can trust and count on are ones that will last. ATMC saved my life, and without their help I would not be who I am today. Now I am a part of the internship program, which is fun and teaches me skills for jobs and provides me with aftercare that surrounds me with individuals who are making progress in recovery.